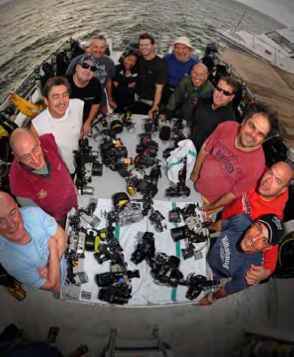 Twelve enthusiastic underwater photographers arrived in Grand Cayman in late January 2009 to attend Alex Mustard's Digital Madness Workshop. There was a complete mix of nationalities and backgrounds. A few Americans, some Brits and a Serb. All came with one aim; to improve their photography and to learn something of what makes Alex Mustard such a force in today's world of underwater photography. 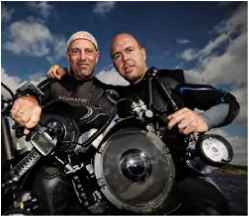 Alexander Mustard trained and worked as a marine biologist until 2004, but now works full time as a professional underwater photographer. He took his first pictures underwater at the age of nine. 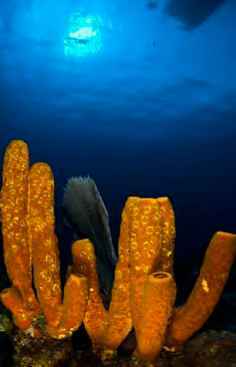 He is widely regarded as one of the world's most creative underwater photographers. His images are known for their distinctive style that makes them instantly recognisable. They have won many awards and have been widely published. Alex was an early adopter of digital and has pioneered many of the specialist techniques of digital underwater photography, such as the use of filters in available light photography and using telephoto lenses underwater. 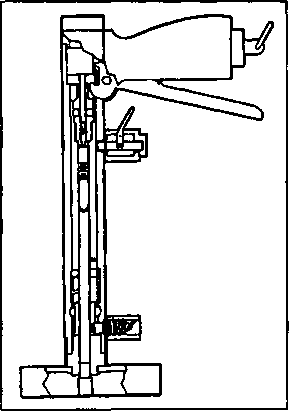 The subject of the workshop was "Light". It may sound a little innocuous but as we all know, shooting light underwater is not technically easy to do, and is the basis to making any image, underwater or not. As photographers we are painting with light and knowing how to control that light is the essence of all that we create. Alex split his lectures into three areas, ambient light, strobe light and balanced light. He gave us lectures on all three and in between we were let loose on the walls and reefs of the East End of Grand Cayman to experiment. Diving usually consisted of two morning dives and an afternoon dive, although we had one four dive day and a couple of long shallow dives in areas not usually dived. Workshop participants and their gear. All sutface photos © Predrag Vuckovic www.extreme-photographer. Micro Nikkor. Tokina 10-17mm a ninety minute dive in six meters of water over a wreck that had broken up and got moved about during Hurricane Ivan in 2004. This site is never dived by day boats and half the group were rewarded with a sighting of a two meter Great Hammerhead in three meters of water. We were actively encouraged to shoot wide angle as much as possible so I got to give my new Tamron 10-17mm a good workout. It did not disappoint, with its corner sharpness and close focusing ability. This is now my go to lens for wide angle. Grand Cayman also has some excellent macro opportunities so I ended up with quite a mix of shots; some of these are definitely going into my portfolio. I feel that one of the main advantages in doing workshops and courses such as this is that it gives you an opportunity to dive places that the normal day boats go to quite infrequently. Unless you are a professional photographer with a budget that allows you to rent a boat for yourself, many of us dive with others in the group that are not photographers. This can lead to frustration on both sides as the non photographers don't want to hang in the water while you sit in front of a fish for fifteen minutes, and you want to stay in one place for as long as it takes you to get the shot and not go rushing around the dive site at breakneck speed. The boat was usually moored over the same site for two dives and we were allowed to enter the water in our own time before diving the site a second time. This really allowed you to scout the site, take some shots and see what was working, then check your shots back on the boat and discuss ideas before going back and trying to improve on the first dive. Anemone 105mm Micro Nikkor. 1180 atfl4.1 am used to seeing these all over Asia Pacific but they are not common in the Caribbean. This one seems to glow with colour. was testing that was made from a Tupperware box and what looked like toilet paper rolls! 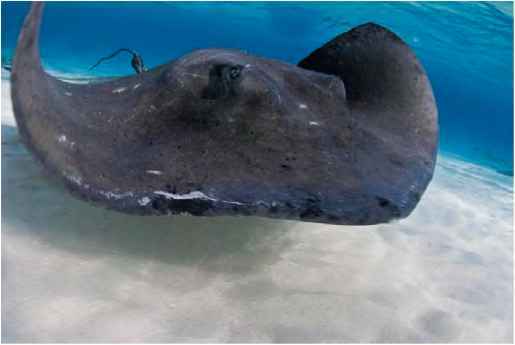 Probably the highlight of the trip was a morning spent in waist deep water on a sandbar called Stingray City No strobes and no scuba so everyone was weighted down so that you could drop under the water quickly and hold your breath while the rays swam towards you expecting to get fed. An early start ensured we could get free time with the stingrays before the cruise liner tourist boats arrived. Early morning light lent itself to black and white photography, as we were encouraged to shoot across the light to catch the shadows of the ripples on the sand bed. Each person applied their own individual style to produce end results that were quite different. as a natural leader, encouraging and offering advice constantly. At no time did I feel that he was holding anything back; his methodology in creating his photos was open and available for all to see. Actually applying it however, was a different matter, but that is what keeps us diving and shooting. If you want any kind of final thoughts on the trip, then of the twelve of us, three had already done more than one trip with Alex before, and five, including me, will be back in June to dive with Alex in the Red Sea. Don't think you can have a better recommendation than that. Alex Mustard at the ability of the group as a whole. Everyone there had at least one quite exquisite photo that any professionals would have been happy to claim as their own. It was fascinating to see how different people interpret the same subject, and also to see the style that someone naturally adopts. After a couple of days it was possible to identify the owner of a photo just by viewing it.